OLED Monitor, Professional Recorder, and Playback Deck, all in one! 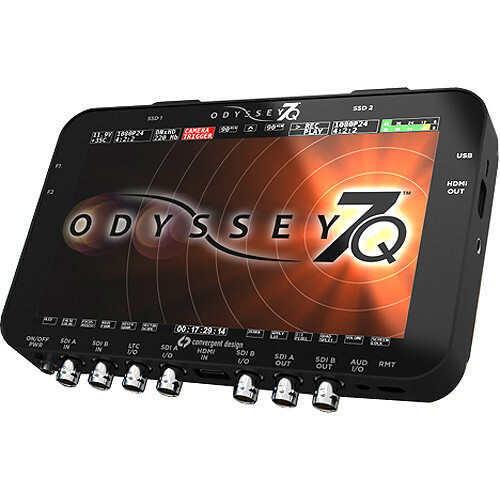 The Odyssey7Q combines Convergent Design's knowledge and experience of both broadcast and cinematography recorders, while adding the capabilities of a high-end professional monitor. Odyssey7Q is a brilliant 7.7" OLED monitor with 3400:1 contrast, true blacks, 1280x800 resolution and powerful monitoring tools. Odyssey 7Q monitor recorder is the best tool in your kit...Powerful and lightweight! It's also the best and most versatile portable recorder, enabling you to record 4K Apple ProRes, 4K RAW, Canon RAW, Sony FS7/FS700 and ARRIRAW (with the Odyssey RAW Bundle). Multi-Stream Recording and more will be available soon. -A 3D LUT is a way of transforming an image, where any set of red, green and blue values at the input map to a different set of red, green and blue values at the output. Unlike a 1D LUT, where a given red value at the input will always map to the same red value at the output (like Curves in Photoshop) with a 3D LUT, the output value in each channel is affected by the input values in all three channels.